Hello Friends, Fam, and Folk Fans! When I started this newsletter I was going to say happy new year, but by now the year is a teenager who is shaving and wants the car keys. 2017 was quite a year as Dan and I grappled with this new era of politics. We have both written songs about the current craziness. Dan isn't performing his song Covfefe in concert yet. Maybe if people ask for it….. I have a recent song called Love is Gravity which was inspired by Adam Marczyk’s blog post. There’s also plenty of philosophy and world view on our new Jamcrackers album Get Crackin’. Wanda Fischer, host of Hudson River Sampler on WAMC, put it on her top 25 folk albums of the year. I went to the Women’s March in D.C. in Jan. 2017. It was beautiful and profound to be among all of those peaceful humans. My Adirondack friends and I were packed in like a perfect Tetris game so we didn’t hear any music or speeches. Instead we asked the women around us where they were from and why they were there. We met Georgetown alumnae, D.C. natives, a woman from Florida, and a crew from Washington state, all with stories to tell. We marched with students from Paul Smith’s College for the Science Rally, and marched in Syracuse for the Climate March. This year, I marched in Albany with my daughter, Willow. I find it sustaining to hear those speeches and songs. I am still onboard with Empire State College, teaching and mentoring part time. I teach several fun things as independent studies, such as Music across Cultures, Women in Song, Children’s Music, and American Roots Music. They say if you really want to learn something thoroughly, teach it. I am fascinated by all the life music brings to our celebrations, activism, and culture. I am based in the Auburn Unit now, which is closer to home and I adore my colleagues. My 91 year-old mother is still living independently there as well. Forward into Light has been a rewarding program Dan and I have been part of this year. Andy Spence and the Old Songs organization have produced the nine-person cast folk-theater show. We share the stage with Susan Trump, Annie Rosen, Bill Spence, Toby Stover, George Wilson, Greg Artner, and Terry Leonino. I searched several archives for suffrage songs in writing my masters thesis so it is very satisfying to have them woven into the American women’s suffrage story. Dan and I have also developed a shorter version of the program which we also do in costume as a duo. Singing for Suffrage is available for libraries, historical societies, women’s groups and school programs. Dan and I are healthy, happy, and grateful. I climbed 10 mountains last year, seven of them with fire towers. I’m gearing up for more this year, hopefully with the grandkids. Ruthie is now 6 and Henry is 2. Willow and Winter still live in Albany and Gardiner respectively. As our friend Kary Johnson says, “Isn't it weird when your kids are older than you think you are?” They promise they’ll haul me up the mountain if I’m too slow. Are you still reading this epic tale? I could go on and on, but it looks like I already have. Please come to a concert if we perform near you. Folk venues need your support and so do we! Radio hosts love to get requests so please ask your favorite folk DJ to give us a spin. Thanks for all you do, for beds, meals, beers, dog water, comp tickets, sound guys, folding chairs, clapping, encores, bad jokes, good stories, buying CDs, GF chocolate torte, singing along, and friendship. ​Thanks for all the love you beam up at us while we play. We’re the luckiest folks on earth. Happy President’s Day! My annual missive gets later and later. 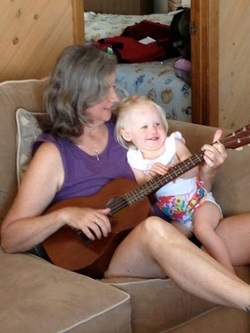 Dan and I had a great year, writing music, performing, traveling and playing with grandchildren. Ruthie, Winter’s daughter, turned three in January and she is pretty entertaining. When we play with her we have to mind our p’s and q’s or else she leans down and gives us a good, serious talking to. At Thanksgiving we went outside with Weewo and Bampa Dan (Grandpa will come later) and made a snow turtle and then an agidator (alligator). I don’t think our family will ever call that reptile by its correct name again. Dan’s stepson, Taurin, and his wife, Courtney, had a baby boy, Jasper, on 8/27. They came east in October so we got to meet the little guy. Yay! Winter works as a Speech Therapist at Helen Hayes Hospital three days a week now. Willow works as an ecologist for an engineering firm in Saratoga Springs. On Feb. 5th I celebrated five years of teaching and mentoring for Empire State College. I had a great experience in going back to college decades after finishing my associate degree and getting my bachelors in Women’s Studies. Now I get to help others develop their degree programs. Dan was chosen as our Artist in Residence this academic year so we’ve had the opportunity to collaborate on courses, presentations and workshops. He’ll be building lap dulcimers with students and staff in April. I’ve made an attempt at environmental activism in the past year. Dan and I both worked with a financial planner in Saratoga to divest ourselves of fossil fuel industry stock. We realize that our small funds won’t make any difference to Exxon or BP, but we are part of a growing movement. I am also a supporting member of 350.org. 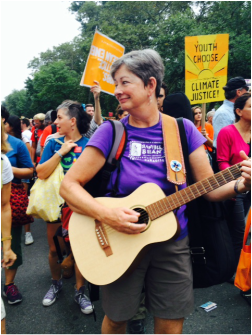 I went to the huge Climate Rally on Sept. 20th in Manhattan. I took my travel guitar and wandered the parade between the women from NOW, to a Balkan Brass Band, to the Sisters of Mercy in their purple t-shirts. Anyone who was singing or banging on something was a magnet for me. The minute of silence and big cheer afterward was incredibly profound. Imagine NYC completely quiet, no traffic, no blaring horns, no movement of bikes or pedestrians. Even babies were quiet. 400,000 people were silent. At the end of the minute a huge wave of sound came up the avenue from behind us and our yelling became part of it. AMAZING! I will also be part of SAMFest (Science Arts Music) again this year at Paul Smith’s on April 18th. I’m looking forward to hearing what Curt Stager’s Environmental Communications students’ presentations and performing my new songs. This September at the Arts and Healing Retreat at Great Camp Sagamore, Fran Yardley, Wanda Burch and I stepped down from leading the retreats for Creative Healing Connections. Fran and I have been leading retreats there for the past 16 years so it was quite a decision to make. Last spring a group of 14 women gathered in Saranac Lake to record several songs written for, or at, the retreats. Dan made a live recording of our choir. I sang five other songs I wrote in collaboration with workshop groups at retreats. Now we have the project mixed and mastered and I hope to have CDs to give to everyone involved later this spring. I am happy to have this body of work documented. I am dedicating the recording to Randy Lewis, who led writing workshops at retreats and taught us the value of words. As we near the decade we used to consider the gateway to old age, we are more and more grateful for good health, new music, audiences to hear it, the laughter of grandchildren, and our friends. Thank you for your love and support and being honest when our heads are. . well, not in the game! Keep in touch. Dear Folks: Happy Solstice! There’s been so much going on this spring I hardly know where to begin. In March we found out that Dan’s painful jaw was actually infected and fractured due to the radiation cancer treatments he received four years ago. Luckily, they now have a surgical method to reconstruct the jawbone. On April 15th, Drs. Coniglio and Vega took a section of Dan’s fibula from his leg and replaced a section of his jaw with it. The operation was a complete success but Dan has a long road of recovery, with swelling in his face and neck, a hole in his trachea, and an incision down the side of his leg from his knee to his ankle. As with previous treatment, Dan is a tenacious, courageous (not so patient) patient. Even though he is still walking with a limp, he has performed for three concerts already, sitting on a stool behind the dulcimer, which hasn’t slowed him down one bit! I am still teaching and mentoring part time for Empire State College in their CNY Syracuse offices. Since I earned my Bachelors degree with them, it is gratifying to help fellow students meet their goals with college degrees. ESC named me a co-recipient of the prestigious Altes Prize this year for using my scholarship and expertise to benefit my community. This honor recognizes my work with Creative Healing Connections in leading workshops and activities at retreats for women with cancer and chronic illness. By now you are thinking, “What about the music?” Well, we have just released a new duo recording called Esperance, named for our farm in Red Creek, NY. It has five original songs from each of us, and a few swingy tunes that feature Tom Hodgson on guitar and Henry Jankiewicz on fiddle. I love singing those jazz standards! We’re all hepped up about new songs and new arrangements we’ll be performing with Dan Berggren this summer. Jamcrackers will be playing from one side of the Blue Line to the other and we hope to see you there. Thanks for all your purchases, performance attendance, and praise. With friends like you, how can we keep from singing?